USB Magic Wand Is The Worst Way To Talk To Chicks | OhGizmo! By Chris Scott Barr on 12/21/07 • Leave a comment! Have you ever seen someone across the room and wished you had some way to communicate with them? Sure, you could actually walk over to them and talk, but that would involve some effort on your part, by forcing you to walk. Instead, you should just wave a Magic Wand and spell out your message. That would make you so much cooler. Sure, you’re going to have to figure out your message long before you’re presented with this situation, like when you’ve got it hooked up to your PC, so you’ll want to be a forward-thinker. 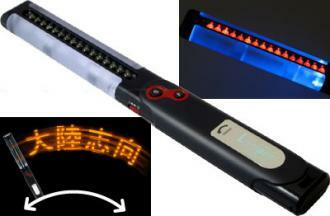 This wand uses blinking LCDs that create letters, and forming words when you wave it back-and-forth. I can’t think of any practical uses for this product, so I’ll leave that up to you guys. It should be noted (and is, on the company site) that this product isn’t intended to be used while jumping off of a building. It is however an acceptable method for picking up chicks and communicating with UFOs. This modern marvel of hi-tech communications can be yours for around $35.